This evening is thanksgiving, and my roommates and I are all celebrating a big Thanksgiving Dinner tomorrow night, for shabbat. I made my cornbread for tomorrow night, but wanted to make something new for dinner tonight. I was in the mood for a healthy cake, so I decided to scramble through the ingredients I have in my kitchen, and put this together. In this recipe, I used my hands to mix the ingredients together. While mixing, out loud, I told the cake all of the things I am grateful for. With all of that love and gratitude, it ended up tasting delicious! Have fun in the kitchen, and let me know if you have any questions! Put oats and honey in a bowl, cover with water, mix and let water absorb into oats, takes about 20 minutes. In a large bowl, add apple, honey, carrots, raisins, oats, nuts and stevia. In a separate bowl add flour, cinnamon, vanilla, and baking powder. Mix well. Add applesauce to dry ingredients, and with your hands, massage all ingredients together. This should create a dough like consistency. 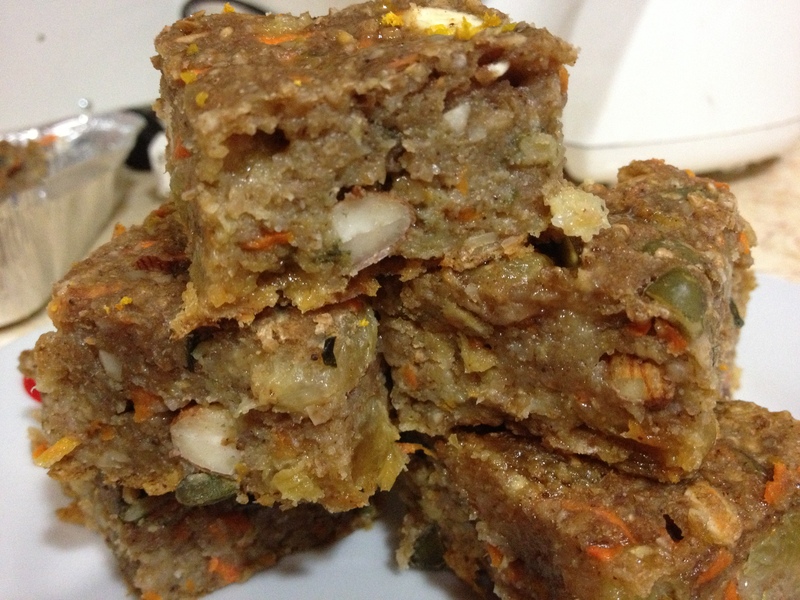 Add dough to apple carrot mixture, and with your hands, massage all ingredients together. Transfer entire mixture into an 11 x 7 x 2″ baking pan. Bake at 350 for 25 minutes, or until inserting a fork and it comes out dry.